A durable corrugated filing box kit for the proper filing, identification, and storage of glass slides or cassettes. The complete set comes unassembled in packages of 10. Slide storage File with four compartments, each has one drawer, drawer inside measures 10½" L x 2 " W x 1½" H (267 x 60 x 40 mm), each drawer has one center divider, each division is 1⅛" wide, accommodates up to 250 slides or 500 slides per drawer, or 2000 slides per file, 10 stackable files per case or 20,000 slides. When these boxes are used as a cassette storage file, each compartment has two drawers, one on top of the other. Four compartments or eight drawers, each drawer accommodates 63 cassettes or 500 cassettes per file. 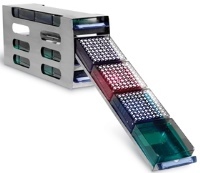 10 stackable files per case or 1500 cassettes. Overall measurement: 11½" (L) x 12" (W) x 4" (H), (295 x 300 x 100 mm). Individually, self-contained, stackable drawers. They hold approximately 250 Histo-cassettes or embedding rings. Supplied in economical two-drawer packages with interlocking ridges on the top and the bottom for easy stacking of as many cabinets as you want. Each drawer is encased in a rugged, high impact plastic sleeve, so your cassettes are completely enclosed and protected. They come with color decals which allow you to organize each by function. Cassettes are not included. The unit measures: 15¾" (L) x 9" (W) x 2" (H) (40 x 23 x 5 cm). 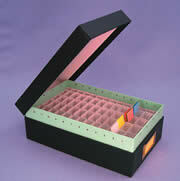 A histological embedment block cataloging and storage system. This file system incorporates the necessary features offering embedment block protection, simplified cataloging, reduction of filing error and facilitation of retrieval. All of this while conserving space and being very affordable. The tissue files come with 100 partitioned compartments arranged 10 deep and 10 across. By removing alternating partitions, each compartment can be doubled or quadrupled in size. For other storage needs, the partitions may also be removed. For cataloging, each compartment is numerically indexed on a permanent chart inside the lid which also provides space for detailed information. Tissue files are made from solid fiberboard with a protective, attractive, scuff-resistant exterior green covering. Its hinged lid lifts open and with a cloth stay support the lid can be kept in the open position. A prepared Microscope Slide Cataloging and Storage System. The slide files contain 48 partitioned compartments which will hold an estimated 10 of 1x3" glass slides per cell (480 slides per case) or 10 of 3 x 2" slides per cell (240 slides per case) by removing two alternate long partitions. A 3/8" (100 mm) cushioning space surrounding the partitioned compartment serves as a protective barrier against damage to the stored slides. For other storage needs, all or alternate partitions are removed for conversion to larger size compartments. For cataloging and slide retrieval, each compartment is numerically indexed to a permanent chart on the underside of the lid which also provides space for information. The files are constructed from solid fiberboard with a protective and attractive, scuff-resistant green exterior. The reinforced hinged lid conveniently lifts open with a cloth stay support and keeps the lid in the open position for easy slide filing and retrieval. Allows for the convenient storage and retrieval of microscope slides or transparencies. Two different vertical filing drawer sections can be stacked in any combination. 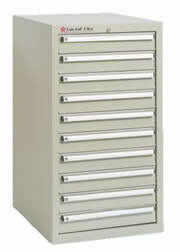 Each 1" drawer section has 14 drawers and holds 465 (1" x 3") slides per drawer. 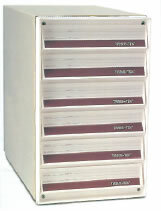 Each 2" drawer section has 7 drawers and holds 271 (3" x 2") slides or 271 (2" x 2") transparencies per drawer. Allows for the organized storage of blocks that have been embedded using: Tissue Cassettes, Biopsy Cassettes, Mesh Cassettes, Mega Cassettes, Processing/Embedding Cassettes and Embedding Rings. This item has been replaced by Lab Aid® Ultra™ II Storage Cabinets below. For interchangable replacement drawers and compatible accessories, see Lab-Aid® Ultra™ II. The Tissue-Tek® Lab Aid® Ultra™ II is the next generation of large capacity slide and cassette (block) storage units with integrated security features. The renewed Lab Aid® Ultra™ II has improved construction making the cabinet sturdier, and reducing the risk of damaged goods during shipment. Along with improving on the construction and sturdiness of the cabinet, some modifications were made to the trays. 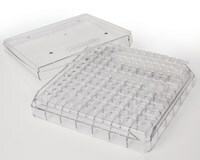 The trays are redesigned to accommodate both slides and cassette blocks, eliminating the need of purchasing different trays for different needs. The new size of the trays also reduces dead space in each of the drawers to effectively use the full capacity of the drawer and therefore increasing the number of blocks or slides that can be stored, without making the cabinet larger. Note that the new trays are compatible with the previous Lab Aid® Ultra™ models, so existing customers can still get replacement trays in the future. Lids are now available to protect cassette blocks that will be stored for long periods of time, reducing exposure to outside elements. These trays with lids can also be used for temporary storage outside of the cabinet. They cannot be used for slides. A new trolley has been added to the accessories portfolio of the Lab Aid® Ultra™ II. The cabinet can be placed on the trolley to make it a mobile unit. If a trolley is used, cabinets should not be stacked to avoid the risk of tipping over. Converted drawers hold both cassettesandslides. The same cabinet can be used for both purposes. The new trays are compatible with the former models. 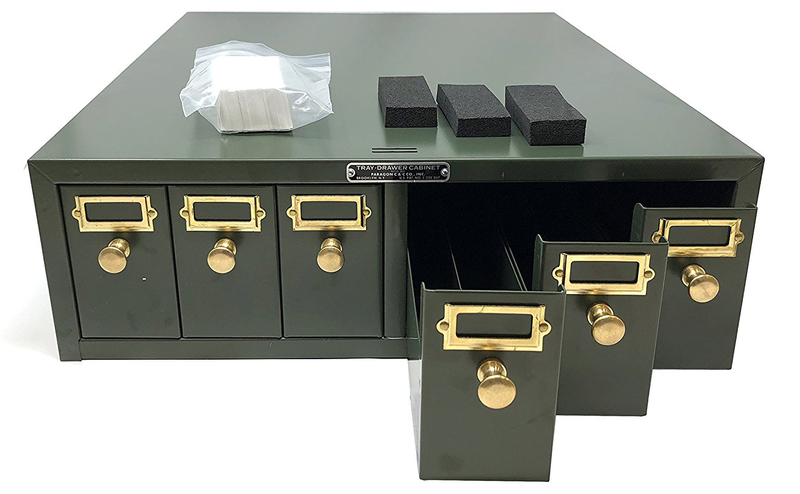 Our newly introduced cabinets for filing 3x1" slides is the most effective system available to the ever-growing problem of slide storage and retrieval. They are compact, sturdy and economical!!! The cabinets are stackable and are secured by interlocks. The base (order separately) lifts the cabinets 4¾" off the floor. All units are constructed from heavy gauge reinforced cold rolled steel, electrostatically finished in dura-baked enamel in an attractive green color. Drawers are easily removable and interchangeable. They have rolled edges on each side for added strength. The riveted card holder on the front of the drawer speeds up slide retrieval. Each cabinet has 6 drawers, with two compartments per row, so you can store as many as 750 slides per drawer. The outside walls and center divider are lower than the slides, allowing for easy removal of any slide. Each drawer has an exclusive built-in hand grip at the rear and a full sized handle at the front which allows the drawers to be removed and used as trays. Each cabinet comes with a package of Memorandum Markers and a set of movable Compressor Blocks. For 2x2 Slides and Kodachrome Transparencies. These slide cabinets have the same construction and features as our Micro-Slide Cabinet (Cat# 74780-20). Each file comes with three drawers and can store up to 2,250 slides. 35 mm Slide Cabinets interlock with themselves and with Micro-Slide Cabinets, for total flexibility and storage convenience. The depth and width dimensions are the same as (Cat#74780-10) shown above; the height is about 1" (25cm) lower and uses the same base as our (Cat# 74780-10). This freezer rack is constructed of corrosion-resistant stainless steel. 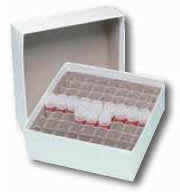 For slide boxes, reversible PCR® and 50-Well EPS racks in upright freezers. 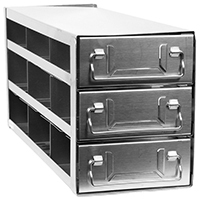 Constructed of corrosion-resistant stainless steel with 9 (3 x 3) rack spaces. For Assay Plate and PCR rack storage in upright freezers. 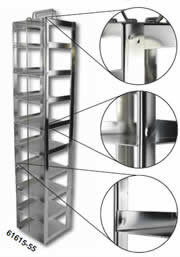 Constructed of corrosion-resistant stainless steel with 16 (4 x 4) rack spaces. Rack includes 3 wire handles and 4 vertical locking rods. These trays effectively aid in the cooling of tissue blocks. They are filled with freezer gel that stays frozen longer, up to 6-8 hours. Simply refreeze at the end of each day. Designed to fit in a standard 2" freezer rack, this 144-place PCR Tube Freezer Box will hold individual and/or strip 0.2 ml PCR tubes. True North® freezer boxes (cryo box) are made from a specially formulated corrugated or thin film polypropylene and were designed with sustainability in mind. With superior durability, polypropylene outlasts the cardboard box alternatives that are susceptible to softening and producing dust. They can freeze down to temperatures of -80°C and thaw multiple times without a problem. They are moisture resistant, significantly reducing the chance of mold growth. When it comes to saving valuable lab space, True North® Flatpack Freezer Boxes are supplied "flat-packed", which eliminates the hassle of stacking and reduces the amount of space needed for test tube storage. When ready to use, assembly is easy and pre-assembled dividers are included with each box. 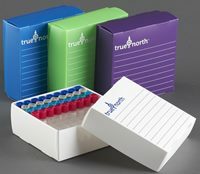 True North® freezer boxes come complete in packs of 10, and multiple sizes and colors available. True North® thin film polypropylene freezer boxes are made from specially formulated thin film polypropylene, designed with sustainability in mind. They are moisture resistant, significantly reducing the chance of mold growth. Safe to -196°C, they are compatible with mechanical freezers and low temperature storage vessels, as well as with most standard 2" (50 mm) freezer racking. With superior durability, thin film polypropylene will outlast cardboard boxes that are susceptible to softening and producing dust, as well as provide a cost effective alternative to polycarbonate boxes. They are supplied in flat packs to save storage space and are easy to assemble. Four colors available in packs of ten. For use with Stainless Steel Freezer Racks. Store cryogenic vials in liquid nitrogen or in mechanical freezers in our freezer storage boxes. Box footprint is 133 x 133 mm. 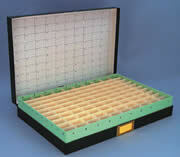 Select a box and a partition that fit the size and number of vials for your needs. Cardboard boxes can be labelled with Cryo-Tags for easy identification. Both the boxes and dividers are available in packs of 12.